It has been said that, "it takes a village to raise a child". Today, budget cuts, shrinking instructional time and limited school resources have made the business of educating our children - all our jobs. Through intentional and diligent year-round fundraising efforts by the Schaefer Family group, much needed funds for items in the classrooms, enriching field trips, class sets of books, materials to support the ever-changing educational standards, assemblies, and school-wide math/literacy software are purchased on behalf of the school. Through these efforts - both community and capacity building that this partnership is ensuring this village to foster the brightest possible future for for the Schaefer Bears of today and for those who will join the student body in the future. 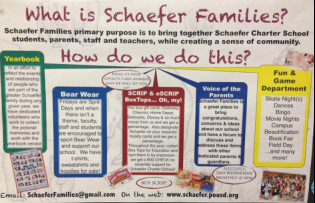 Please feel free to contact Schaefer Families by email, SchaeferFamilies@gmail.com. All of our activities are listed on the monthly Bear Bulletin that comes home as well as on the calendar on this website. Also check the News page for a quick preview of upcoming activities and events.